Dr. David Siuta joined the NVU-Lyndon Atmospheric Sciences department as a Research Scientist in the Fall of 2017. He comes to NVU-Lyndon after completing his Ph.D. at the University of British Columbia, where he studied the use of numerical weather prediction forecasts for wind energy in mountainous topography. For his dissertation, Dr. Siuta showed the sensitivities of hub-height wind-speed forecasts produced using the Weather Research and Forecasting (WRF) model to boundary-layer physics choice, successfully developed a method to produce reliable probabilistic forecasts, and derived new similarity relationships describing wind profiles over vegetated mountain ridges. He also pioneered efforts on the use of cloud-computing services for real-time numerical weather prediction. 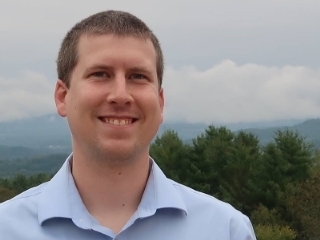 At NVU-Lyndon, Dr. Siuta will apply his knowledge to research snowfall and ice storm prediction in Vermont with Dr. Jason Shafer. Dr. Siuta is originally from central New Jersey, but has also lived in Wyoming and British Columbia. One of his favorite annual activities is hiking Colorado’s high mountain peaks during the summer. After moving to Vermont, he is looking forward to exploring many of the northeast’s hiking, biking, and running opportunities.